Falling Hook, Line and Sinker is the fifth in a series and as soon as I began reading, the characterisation was brilliant and after just a few pages it didn’t matter I had no previous knowledge about the back story. Throughout the whole novel I thought the characters were very realistic and consistent and although the story had the same sort of themes as most teenage girl’s books, such as boy and family issues, it was freshly written. Throughout Hook there were many moments that made me laugh out loud such as: “not just because I’ve gone off my grub but because Jack is about to kick me back”. This was a great example of the sibling rivalry between Electra and Jack which really kept the story alive at times. Also the nicknames used throughout the book were funny yet realistic, and helped make the characters even more relatable. Electra’s story is written so that empathy is felt not only for her but also for other characters and even FB when his heart is broken by Electra. When Electra visits her grandmother with her father and Jack, the awkwardness that is created really helps you picture the scene and you can smell the smoke and hair freshener at the grandmother’s house. The theme of midlife crisis is also brought in during this scene which isn’t a typical theme for a teenage girl’s book. But this gave another laugh out loud moment with: “some people pierce their ear some leave their wife!” Jack’s little lines gave the story some amusing moments. The energy and pace of the whole story continues to pick up pace and by Chapter Eight made me feel like saying “aww”. The dialogue is very strong and realistic and allowed the story to move along with energy. I loved the fact we got to see a different side of Phil allowing Electra and Phil’s relationship as stepfather and stepdaughter have more of a connection and a more loving relationship as opposed to the angry and bitter one previously. The description of Phil’s house in this scene actually made me feel physically sick whilst reading, but I saw this as a positive thing. Although the story is written from Electra’s perspective, I really like the fact that in some scenes the other characters views are expressed allowing the reader to see more into all the characters lives, not just Electra’s. When you least expect it the author has written in some twists in the story such as Electra seeing her dad in the park with a woman. The last two chapters I felt were the best written. I was really shocked at the news of Sorrell’s mum dying. Yet these two chapters were tear jerking and they were clearly written carefully as to not be found funny and even though the ending has mixed emotions of happiness and sadness you don’t feel upset or down at the end of the story even after the tear jerking moments. There are only two quibbles, the moment when Dr Burns and Electra’s mum are arguing about FB and Electra being in a relationship. I felt that Dr Burns calmed down very quickly and the argument just simply seemed to stop. I also felt when they find out Sorrel’s mum has died it kind of seemed to be dealt with rather quickly, but then this is counter balanced with the fact that Electra’s mum had a ‘turn’, so is understandable that Sorrel’s mum dying kind of got overlooked. 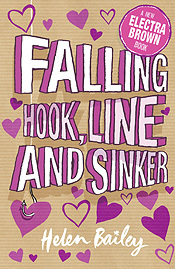 Overall I thought Falling Hook, Line and Sinker was very well written and thoroughly enjoyed reading it. The book is very similar to the kind of books I used to read as a teenager and is also a younger version of the books I read now, which I think is why I found the book so easy to get into. It was a very easy read and once I’d started reading I didn’t want to put the book down.